Ayati, A., Ahmadpour, A., Bamoharram, F., Heravi, M., Rashidi, H., Tanhaei, B. (2011). Application of Molybdophosphoric Acid as Reducing Agent/ Stabilizer in the Synthesis of Gold Nanoparticles under UV Irradiation. International Journal of Nanoscience and Nanotechnology, 7(2), 87-93. A. Ayati; A. Ahmadpour; F. F. Bamoharram; M. M . Heravi; H. Rashidi; B. Tanhaei. "Application of Molybdophosphoric Acid as Reducing Agent/ Stabilizer in the Synthesis of Gold Nanoparticles under UV Irradiation". 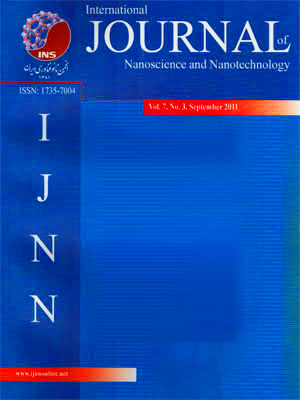 International Journal of Nanoscience and Nanotechnology, 7, 2, 2011, 87-93. Ayati, A., Ahmadpour, A., Bamoharram, F., Heravi, M., Rashidi, H., Tanhaei, B. (2011). 'Application of Molybdophosphoric Acid as Reducing Agent/ Stabilizer in the Synthesis of Gold Nanoparticles under UV Irradiation', International Journal of Nanoscience and Nanotechnology, 7(2), pp. 87-93. Ayati, A., Ahmadpour, A., Bamoharram, F., Heravi, M., Rashidi, H., Tanhaei, B. Application of Molybdophosphoric Acid as Reducing Agent/ Stabilizer in the Synthesis of Gold Nanoparticles under UV Irradiation. International Journal of Nanoscience and Nanotechnology, 2011; 7(2): 87-93. 1Department of Chemical Engineering, Ferdowsi University of Mashhad, Mashhad, I.R. Iran. 2Department of Chemistry, School of Sciences, Mashhad Branch, Islamic Azad University, Mashhad, I.R. Iran. In this paper, we have described the size-controlled synthesis of gold nanoparticles based on the reduction of Au3+ (HAuCl4 ) using molybdophosphoric acid (H3[PMo12O40 ], HPMo) under UV-irradiation. In the process, HPMo plays the role of photocatalyst, reducing agent and stabilizer and propan-2-ol acts as a sacrificial agent. This method allows the synthesis of uniform hexagonal nanoparticles with an average size that is tunable between 1.93 and 119 nm by varying the gold ion concentration, HPMo dose (or molar ratio of gold ion to HPMo) and Propan-2-ol amount. We have found that there is a critical ratio for [Au3+]/[HPMo], in which two opposing trends in the size of gold nanoparticles would happened.